» German minister for food and agriculture visits P.E.I. 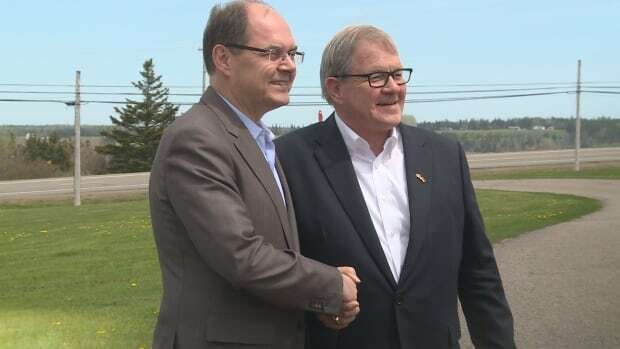 German Federal Minister for Food and Agriculture Christian Schmidt joined his Canadian counterpart Lawrence MacAulay Monday at MacAulay’s farm in St. Peter’s Bay. The pair held a meeting Monday morning along with several advisors to discuss agriculture, sustainability and the Canada-EU Comprehensive Economic and Trade Agreement (CETA). “We are going to do a study on food waste issues with a focus on the use of precise, precision farming, the use of pesticides and fertilizer,” said Schmidt. Schmidt compared Germany to P.E.I., stating that the two places shared similar values regarding trade, sustainability and wanting to set an example for other countries in their responsibility to climate change. The ministers also announced each country’s scientists will share their research and information, with a plan to send Canadian scientists to Germany and vice-versa to study agricultural and sustainable technology. It’s an exchange of information that MacAulay said will benefit farmers on the Island and across the country. There have been several demonstrations across Europe against CETA, including in Germany, but Schmidt said the majority of Europe supports ratifying the agreement and hopes to be an example for doing so. The ministers said that Monday’s talks will bring Canada and Germany’s relationship to a higher level. Germany is Canada’s eighth-largest export market and ranks fourth among Canada’s suppliers. P.E.I. is the German minister’s latest stop before heading to Washington, D.C. This will be his first visit to the U.S. during Donald Trump’s presidency.